I purchased both the Dyson Airwrap and the Revlon One-Step Hair Dryer & Volumizer on my own (vs. receiving as a PR sample or being paid to review them). Below are my thoughts and some tips for both, as well as my current favorite hair products. This post is easy to shop -- you can click through the hyperlinks and images to purchase the items featured. If a pictured item is no longer available for purchase, I try to link a similar item. The post includes affiliate links and codes, which means I may make a commission when you click through or use my code to make a purchase. I also may have received some of the featured products for editorial consideration. I purchased the Revlon One-Step Hair Dryer & Volumizer in February 2018 and used it as well as the Revlon One-Step Hair Dryer & Styler for about ten months. In December 2018 I purchased the Dyson Air Wrap complete and haven’t used my Revlon stylers since then. Both the Revlon Volumizer and Dyson Airwrap have both become hugely popular, so I thought I’d share my experiences on both, as well as the lesser known Revlon One-Step Hair Dryer & Styler. Note that I’m not a beauty blogger and don’t have a lot of patience, skill or time to spend on my hair. I invested in each of these products with the goal of looking somewhat put together without a lot of time or effort. This is a brush and blow dryer in one, which is perfect for someone like me who can’t really manage both. The large oval brush has boar type bristles, which I found to help grab my hair and tame frizz. The large oval brush makes it easy to add volume and speeds up drying time because it comes in contact with a lot of hair at a time. The device has three settings — low, high and cool. I found that I needed the high for it to be effective but that it doesn’t regulate or consistently maintain it’s temperature well. So within a few minutes of using it, it would get extremely hot, which was drying for my hair. For this reason, I would use it only on hair that’s at least 80% dry to minimize the time I need to use it. 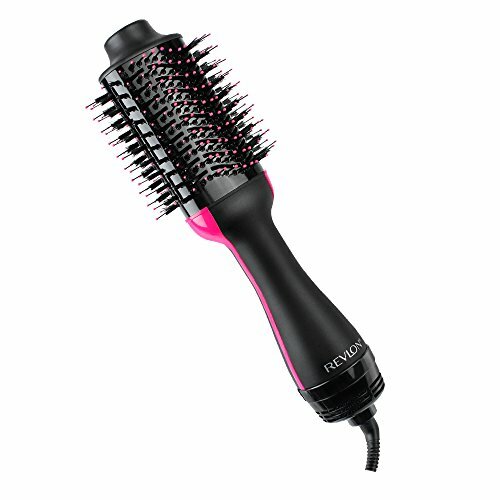 To get my hair from wet to 80% dry, I purchased the Revlon One-Step Hair Dryer & Styler (see below). Another option is to switch it to the cool setting to cool it down (but it doesn’t have a cool shot button, so you can’t just switch to cool easily while it’s wrapped around your hair). Before the Dyson Airwrap came out I recommended this blow dryer a lot (and linked it in my deals group whenever it went on sale). I’ve received dozens of messages from women thanking me for the recommendation saying they can now get great (some even said salon worthy) results at home in only a few minutes. If you aren’t drying your hair regularly or at least don’t need to use it to get your hair from wet to styled, this is a good option for the price. The Revlon One-Step Hair Dryer & Volumizerretails for about $60, so it’s not a huge investment. It’s available at Amazon (often on sale), Ulta Beauty and Target. 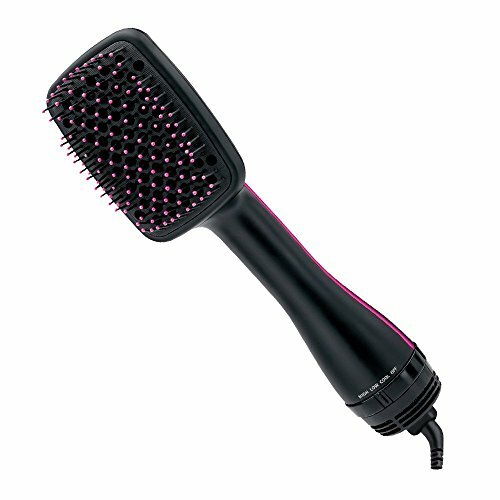 This dryer is similar to the Volumizer (see above) except that it has an incorporated paddle brush with “wet brush” type bristles. If you’re not looking to add volume and just want to dry your hair quickly, this is a good choice. I often used it to get my hair mainly dry (i.e., a pre-styling dryer) before using the Revlon One-Step Hair Dryer & Volumizer to add some style. I’d sometimes use it to completely dry most of my hair and then use the Volumizer to add some style and lift to the front section and top layer. The Revlon One-Step Hair Dryer & Styler retails for about $50, so it’s also not a huge investment. It’s is available at Amazon (often on sale), Ulta Beauty and Target. The Dyson Airwrap came out in 2018 and is probably the most innovative styling tool to be introduced to the market in decades. It’s currently sold out, so when it comes in stock act fast. It does a lot more than the two Revlon stylers combined, but it’s also multiples of the price. See below for information on their satisfaction guarantee. it allows styling without extreme heat by using “intelligent heat control” which measures and regulates the the temperature to help protect your hair from extreme heat damage and maintain shine. What do all the Dyson Airwrap attachments do / which version should I get? Since getting the Dyson I haven’t used my Revlon stylers at all. I love the Dyson pre-styling attachment for getting my hair mainly dry, I’ve used the firm drying brush on my short stubborn post-partum regrowth hairs that like to stick straight up, I’ve used the volumizing brush to quickly add some volume at my roots and style at the end, and I’ve played around most with the Airwrap barrels. People are obsessed with the Airwrap Barrels!! They allow you to create curls or waves with the “Coanda” effect. Basically they replace your blow dryer and curling iron by drying and curling your hair in one step. The barrel attracts your hair to wrap around it, which curls and dries it at the same time without extreme heat. And you can easily set it with a cool blast before releasing it. Also if it seems to be getting too hot before my hair is dry, I will switch to cool blast for a few seconds, then back to hot and finally back to cool to set it. I think the barrels work best for those that have silky smooth hair and want to add curls or waves. This is because they work best on wet hair and also most people don’t want to add curls at the root. So if you have curls or frizz at the top of your hair you would need to address those with one of the brushes first and either leave the bottom of your hair damp or wet it. I would have this issue if I didn’t have a Brazilian Blowout (keratin) treatment on my hair. If you live in NYC and want to try this, my stylist is offering my readers a discount at this time (see my exclusive promos post for details). It definitely takes practice to get the kind of control you would have with a curling wand. In the following photos, I used the narrow barrel and the Coanda effect (having the machine wrap the hair), which took me under ten minutes on mainly dry hair. When curling hair, most people prefer to have the curls wrap away from their face. If you’re using a traditional curling iron you probably hold it right side up on one side and upside down on the other. The Dyson barrels come in sets, one for each direction so you don’t need to flip the device mid-styling (though you will need to swap the attachment). Each barrel has arrows indicating which way the hair wraps around. To tell the right barrel from the left, look at the arrows on the barrel. But don’t look at the barrel directly. Instead look at it in the mirror to tell which way it will wrap your hair. Using the Airwrap barrels definitely takes some practice. You need the hair to wrap around neatly to achieve a smooth result. I find that brushing out each section with my Mason Pearson Pocket Mixture Hair Brush immediately before wrapping it helps smooth out my hair. If you’re looking for a less pricey brush, I also have and like this one. To tell the right barrel from the left, don’t look at the barrel directly. Instead look at it in the mirror to tell which way it will wrap your hair. For achieving beach waves you can use the styler upside down or right side up (the mirror trick works either way). You will likely need to do some trial and error to determine your preference. Here I’m holding the barrel right side up and leaving the bottom part of my hair out to achieve beach waves (note my hair was already styled with a curl and I’m just demonstrating this one piece). Here I’m holding the barrel upside down and leaving the bottom part of my hair out to achieve beach waves (note my hair was already styled with a curl and I’m just demonstrating this one piece). I’ll be honest and share that I thought I’d want to use the Airwrap to achieve beach waves but generally don’t have the patience and instead use the Coanda effect to curl the bottom of my hair and give it some bounce. Whether curling your hair or creating beach waves, if you curl the entire right side in one direction and the entire left side in the other direction, you’re at risk of the curls combining into two giant curls. Dyson recommends avoiding this by switching the direction for each small section, which is a pain. Alternatively, you could (a) flip the Dyson upside down for every other section to alternate direction of the curl or (b) section your hair from bottom to top and do the bottom section in one direction, the next section above it in the opposite direction, etc. You could also (or alternatively to alternating the direction or barrel) use a flexible hairspray to add some definition or texture. More on my favorite hair products below. The Dyson Airwrap is sold on Dyson’s website (30 day money back guarantee), Nordstrom (return any time for any or no reason), Sephora (60 day money back guarantee), Ulta Beauty (60 day return policy) and Best Buy. My recommendation is to purchase at Nordstrom (followed by Sephora )as they have the most liberal return policy. The one advantage of the Revlon One-Step Hair Dryer & Volumizer is the large size of the incorporated brush, which allows you to easily get really big volume. The Dyson round volumizing brush is about half the size, but may be more familiar to those accustomed to drying their hair with a round brush.